Last year, Pinterest had 100 million monthly active users and now it is 150 million. It might be still behind the Facebook or Twitter but a pin is not the same thing as a Facebook post or a tweet. The average lifespan of a tweet is 24 minutes, a Facebook post is 90 minutes and a pin is 1 week! Moreover, driving traffic to your Facebook page is almost impossible unless you pay Facebook to promote it and Facebook still got problems with hashtags. Driving traffic to your website with Pinterest is a lot easier but can people find your Pinterest profile with your unique username or do they have to search since you don’t have the same username for every social media platform? When it comes to usernames, no doubt we were extremely lucky. When we start Greenide, we were only able to claim Facebook and Twitter usernames because others have already been taken. We had use @greenidecom username for our both Instagram and Pinterest accounts, we also had to fill up forms and contact those websites in order to claim our rightful usernames. If you still don’t know how to claim inactive Instagram username, you can read it here. When people read our article about claiming inactive Instagram username, they send these messages on Instagram. We really wish we could have fulfilled your mom’s last request before she dies but we don’t have any hackers in our crew. I am not even sure if the hackers are able to hack websites like Pinterest to get the username they want. If you want a username on any social media, you need to have a website and/or registered trademark with the same name. Greenide: Pinterest sends this email if your request is accepted. 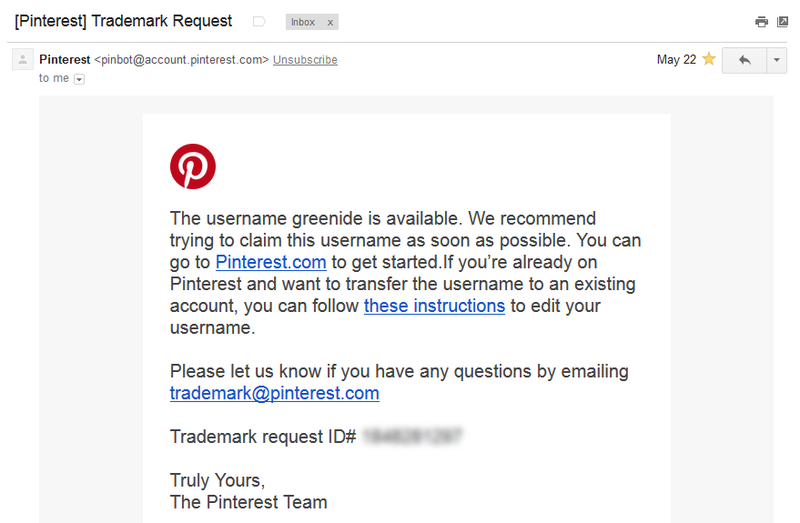 Claiming a Pinterest username was harder than claiming an Instagram username for us because @greenide Instagram username was inactive, which means nobody was using it before we claimed it. It was just an empty username, somebody took it and then either deleted the account or got his/her account suspended for some reason. On Pinterest, @greenide username has already been taken by someone else. I contacted that person to give up the username but she didn’t answer my requests. Honestly, I don’t understand why someone wants to have @greenide username even if it means nothing to her. I would understand if she tried to sell me the username but she didn’t answer any of my messages. You may think she was not using her Pinterest account anymore but I also send her messages on Facebook but she didn’t answer them either. You need to fill out this form in order to make a trademark request. When we made our trademark request to Pinterest, the original owner of @greenide username had 1.2k followers while Greenide account had only 5 followers on Pinterest. 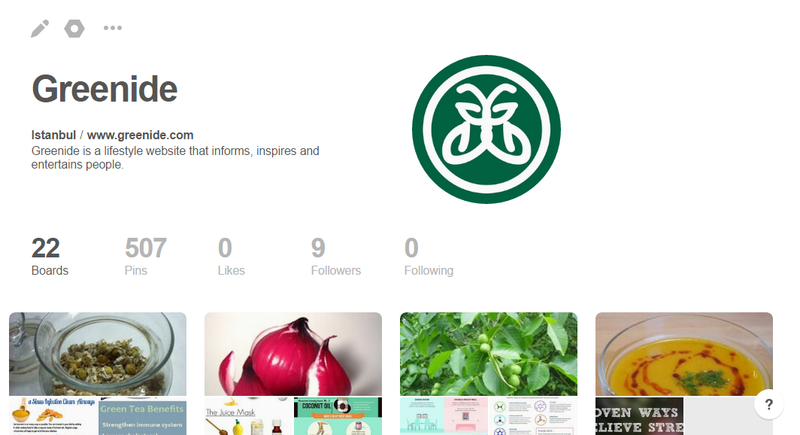 So, Pinterest doesn’t care the number of followers you have; they just want to avoid trademark infringement. 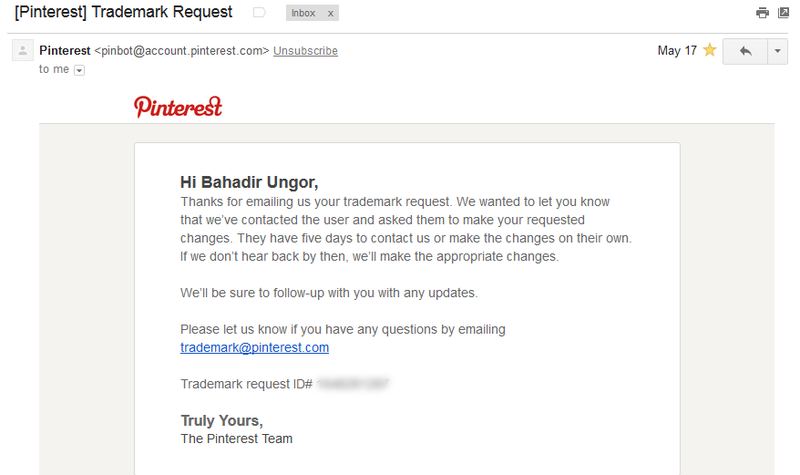 When you make a trademark request to Pinterest for the first time, they might not answer it. Pinterest ignored our first request then we made another trademark request and mentioned about our earlier request; then they accepted our request. Your requests are evaluated by people working at Pinterest so you need to convince them. Every time you make a request, Pinterest gives you “Trademark Request ID#”. Save that ID to your computer and every time you make a request, add your trademark request ID at the end of your submission. Another thing that might help you is having the same username on other social media accounts. When I made my request to Pinterest, I also mentioned that I had the same problem on Instagram and how they helped me to claim the username. Pinterest is another social media website and when they know their rivals are helping their customers, they would like to do the same thing. If your request is accepted by Pinterest, they contact the username owner to change it. If the username owner doesn’t cooperate, Pinterest removes the user and let you have the username. 1. Register a trademark for “coni” or become the owner of www.coni.com. If you can’t do either of them, you can’t possibly claim any username on any social platform. 2. Having more visitors on www.coni.com increases your chances of claiming the username. When we made our first request, Greenide didn’t have much visitors but when we made our second and successful request, Greenide had about 15k monthly page views. 3. Having the same username on other social platforms increases your chances of claiming the username. If your username is @coni on Instagram, Facebook and Twitter; Pinterest will likely to let you have the same username. 4. Telling how other social media platforms help you claim the username and respected your trademark also increases your chances of claiming username. For instance, when you are making trademark request to Pinterest, be sure to add something like “I was experiencing the same problem with Instagram but they helped me to claim @coni username after submitting my trademark request.” into your submission. 5. When you submit your trademark request, Pinterest will give you “Pinterest Trademark ID#”, save it to your computer and if Pinterest doesn’t answer your request within 2 weeks, make another trademark request and be sure to add the trademark request ID# in your request before submitting. If you find this article useful, maybe you would like to give us a hug and follow us on Pinterest to congratulate us on claiming our new – @greenide – Pinterest username?